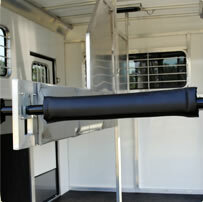 Kingston’s dedication to creating the best horse trailer in the industry is proven time and time again. Especially now, with our new all aluminum trailers. 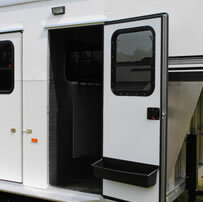 These trailers offer more comfort, convenience and space than any other in their class. Every step of the construction process is carefully checked to ensure the highest standard of quality and performance. Kingston trailers are built with uncompromising commitment to safety and quality. The all new aluminum mainframe is designed to withstand the roughest of road conditions. 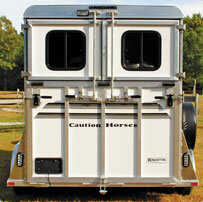 Safety is paramount with Kingston and to insure the safety of your horses, our trailers feature a 2 ” x 2″ heavy wall of tubing running horizontally in the stall area four feet above the floor. 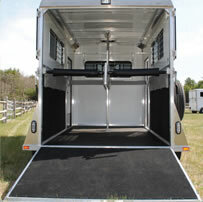 The placement of the tubing is designed to withstand a side impact accident or a rollover as well as to help keep horses safely in their stalls. The strength and durability of our all new aluminum trailers continue to provide long, dependable service and top resale value. Kingston Trailers have been built better since 1960 under the same ownership. High Quality, Great Features… Every Step of the way, a Kingston! Dressing room wall features a 53″ x 19″ double slider window.